Table Top Accessories There are 106 products. Let your eyes trace the alluring grid pattern running along this vase. It's glazed in contemporary splendor and topped with a matte blue finish. 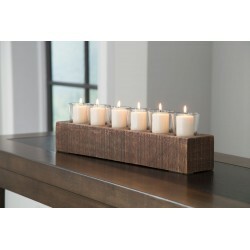 You'll surely enjoy the understated style and ever-present interest it brings to your decor. 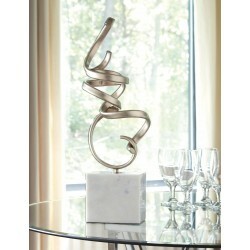 Richly crafted of champagne-finished metal and white marble, this sculpture is high art made highly affordable. 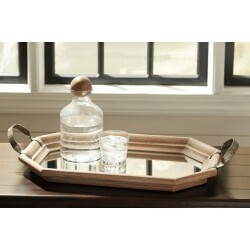 Whether placed in an entryway or main room, what a beautiful way to bend the rules. Whoever said you couldn't illuminate in style? 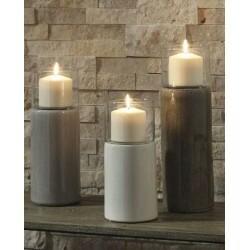 This set of lanterns act as beautiful vessels for the romantic glow of pillar candles, whether placed in an indoor or outdoor space. The galvanized metal offers decor versatility, and the top metal handle and glass hurricane shade make it oh-so-easy to transport. Shapely metal photo holder elevates the art of displaying family photos. Frame secures pictures in place, with a cool floating-on-air quality. 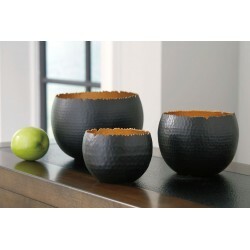 The porcelain vase is guaranteed to add newfound charm to a table, bookshelf or china cabinet. Its dainty blue and white swirl patterning showcases traditional design roots in the classiest of ways.